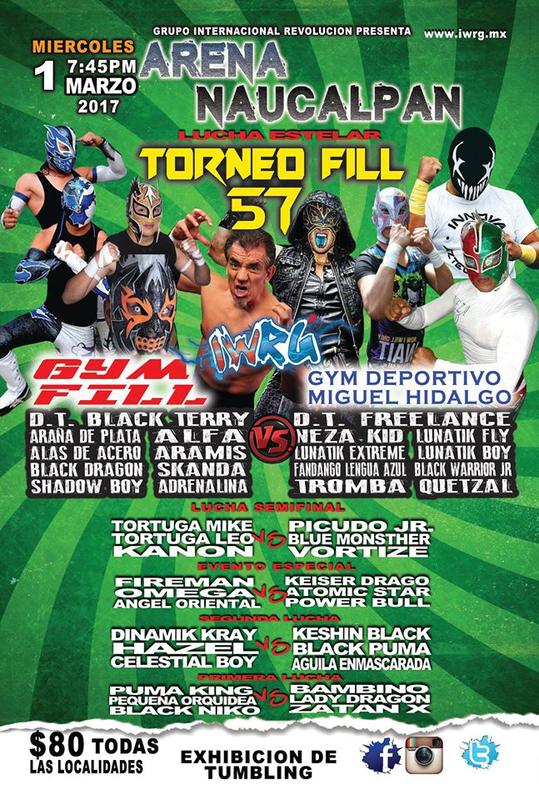 1) Kanon b Picudo Jr.
3) Black Dragón & Pantera b Black Terry & Diablo Jr.
Dragon pinned Terry. Pantera asked for a title shot and Diablo agreed for next week. first defense. Relampago was bloody and had his mask ripped but kept his title. Navarros got along, their opposition did not. 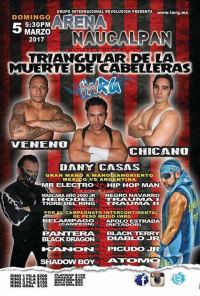 Trauma II's first match here in months due to a leg injury. 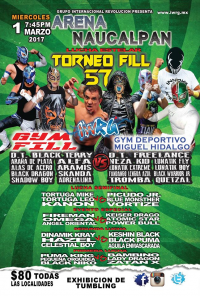 Debut of Tigre del Ring. Electro snuck a beer bottle to Hip Hop Man's head to win. 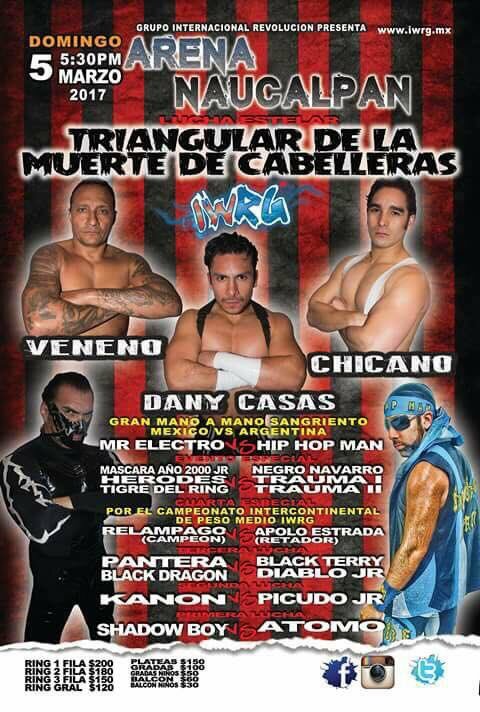 Chicano beat Veneno first, then Veneno took Danny Casas' hair. 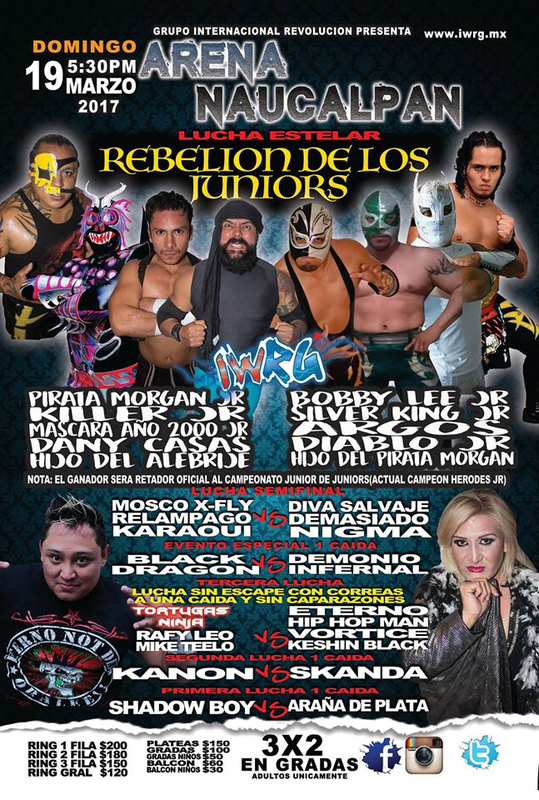 Rudos took 1/3, Demonio beating Pantera and demanding a title shot. Nigma & Relampago made challenges. 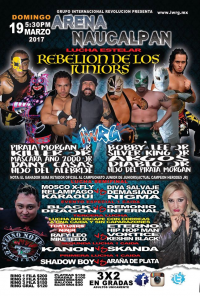 winner gets a shot at the IWRG Junior de Juniors title, held by Herodes Jr. Rules were first to have a seeding battle royal, with the last two going to getting a bye and immediately having that match. Silver King Jr. and Mascara Ano 2000 Jr. advanced. 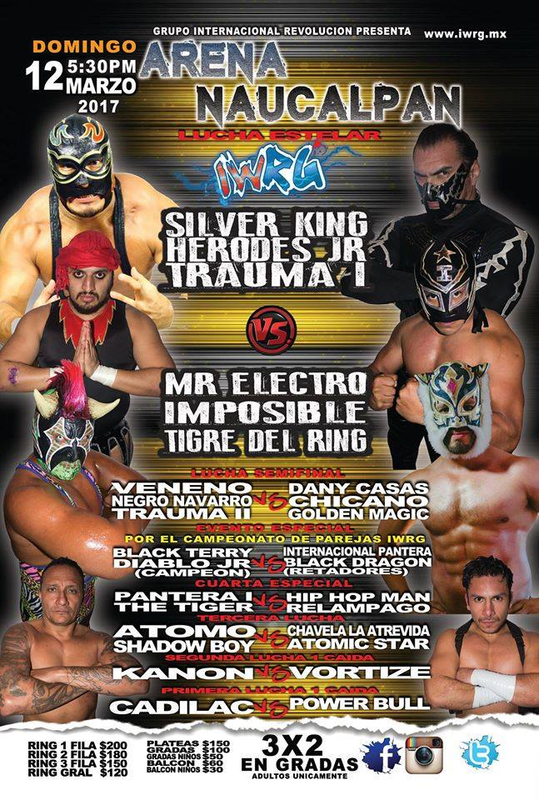 first show for (a) Silver King Jr. since 2013.
first IWRG show for Lee since November. Hijo attacked Danny right after he defeated his brother, but it didn't work out for him. 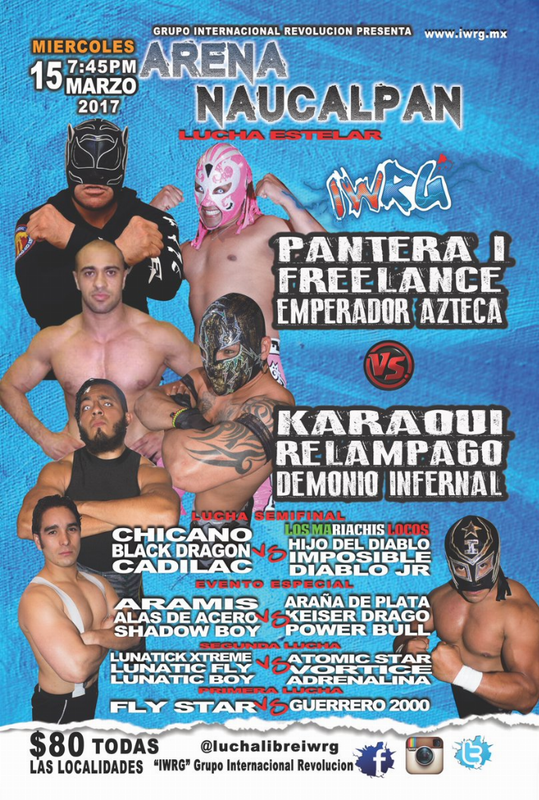 Third straight match with Danny, not with a bad knee, but he took advantage of a distraction to beat Mascsara with a casita. 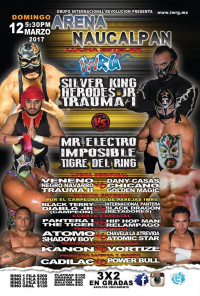 He's earned a match with Herodes Jr.
no Shadow Boy or Arana de Plata. They've turned Ovett's sit down senton into a deadly move now (after he left Vortize bloody last week.) 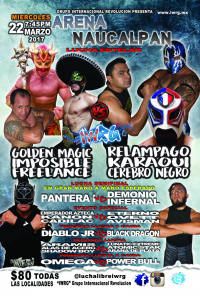 He took out Emperador Azteca in thi smatch. Pantera accidentally hit the referee. Challenges followed. 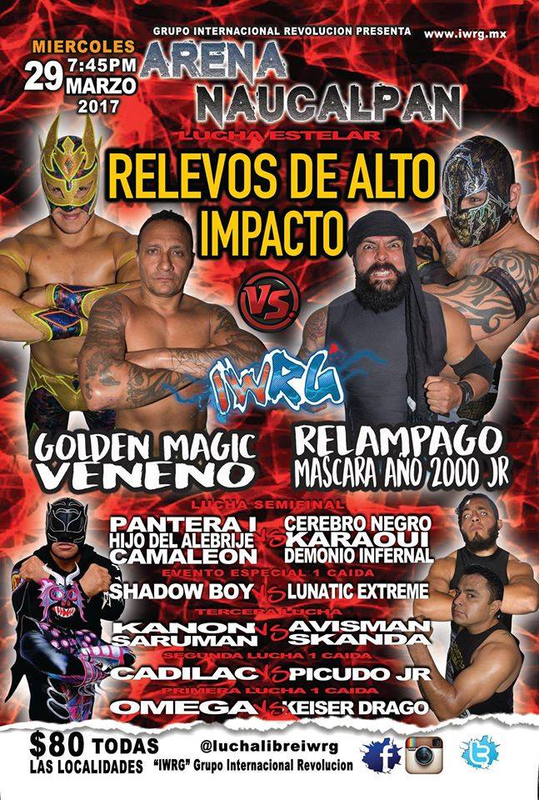 Golden Magic beat Relampago, challenged for a title match. 1) Cadilac b Picudo Jr.
Saruman's first match here in two years. straight falls. +LuchaTV lists the Camaleon as Baby Camaleon I, while The Gladiatores says it was Kamaleon. 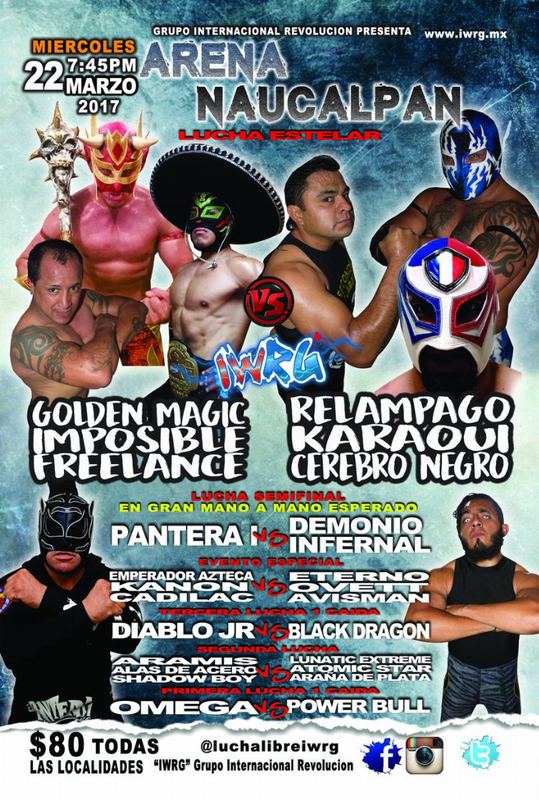 Pantera & Demonio feuded. 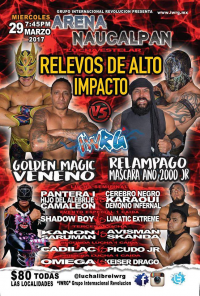 Golden Magic defeated Relampago wants a title shot.